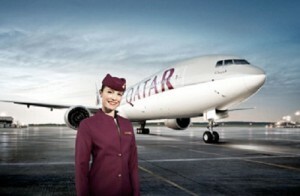 Two days of celebrations marked the launch of Qatar Airways’ new four-times-weekly service between Doha and Durban last week in the South African beachfront city. Qatar Airways’ inaugural flight QR1367, operated with a Boeing 787 Dreamliner, was greeted at King Shaka International Airport by a delegation of senior officials including the Province of KwaZulu-Natal’s Premier Mr. Senzo Mchunu, MPL, the MEC for Economic Development, Tourism and Environmental Affairs, Mr. Michael Mabuyakhulu, the Mayor of eThekwini Cllr. James Nxumalo, Mr. Hamish Erskine, Acting Chief Executive Officer of Dube TradePort and Mr. Terence Delomoney General Manager of King Shaka International Airport. The local dignitaries welcomed guests from Doha as they disembarked from the inaugural flight. Qatar Airways Group Chief Executive, Akbar Al Baker, who arrived in Durban on the inaugural flight said: “It is a great pleasure to further expand our worldwide network with the addition of Durban. We have connected the people of South Africa with our expanding global network for a decade and it is with much delight that we open a third gateway in this beautiful country. “Durban’s prestige as a tourism destination is attracting an increasing number of travellers who deserve the world-class service and best in class value that only Qatar Airways can deliver.” The Premier of the KwaZulu-Natal Province, Senzo Mchunu, welcomed Qatar Airways and remarked, “Direct long haul air services from Durban will continue to be very important for our province as they serve as the lifeblood of our economy, by opening up new markets for our goods around the world and delivering tourists to our shores. In order to position this city internationally we have taken a route to position Durban as the events capital of Africa, this approach has brought us a tremendous amount of international attention and support from the business community, delegates, tourists and fans from around the world.” The celebrations continued on Friday 18th December with a media briefing and VIP lunch at Camp Orchards, Hillcrest, hosted by Al Baker, and attended by local dignitaries including the Premier of the KwaZulu-Natal Province, Senzo Mchunu, MPL, the MEC for Economic Development, Tourism and Environmental Affairs, Mr. Michael Mabuyakhulu and the Mayor of eThekwini, Cllr. James Nxumalo.